Every now and again I have to stop and appreciate something I've made. 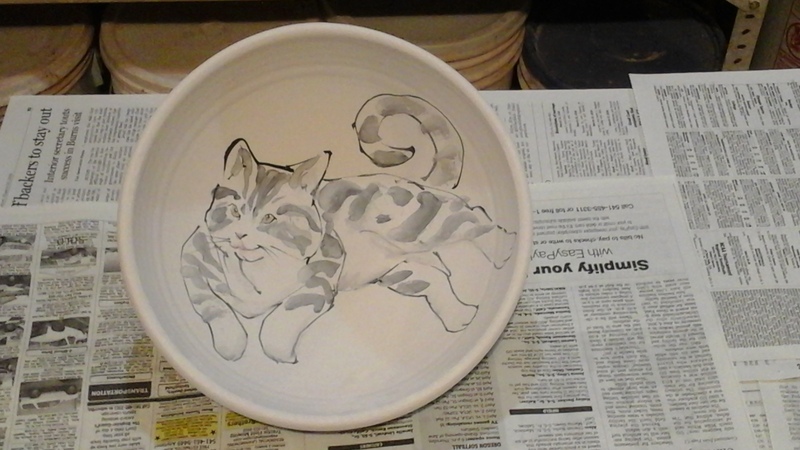 It's only a $15 cat food dish, but the drawing is adorable. How many ways can you paint a cat? I really put way to much effort into decorating $15 cat food dishes. What can I say? I enjoy my work. As it happens far too often, I'm glazing under a deadline--one week to get everything ready for Sunday's loading. So I come home exhausted, throw together supper from whatever scraps of leftovers are in the fridge, and read myself to sleep. Sorry, blog! 1. Welcome to my blog! I've got a lot of great ideas I want to share, just as soon as I find the time to write them. Stay tuned! 2. Sorry I haven't posted in a while! Things have been really busy lately, but I'll get back to this any day now! 3. Here is a picture of my cat. 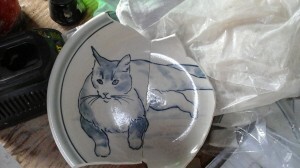 In lieu of my cats, here are pictures of cat pots for other people. First, a replacement job, customer has a Gordon Ward bowl from a good ten years back. Gordon and his wife Barbara moved to Northern California at least a decade ago, and I heard he'd taken up glass fusing, but the internet says he's doing ikebana pots these days. In any event, he's not arond to replace this one, so I took the job. 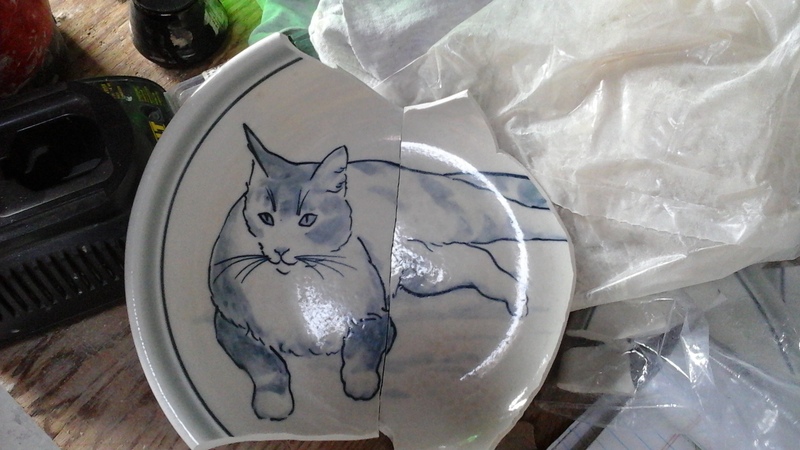 It won't be the same, of course; he worked in porcelain, I use stoneware. 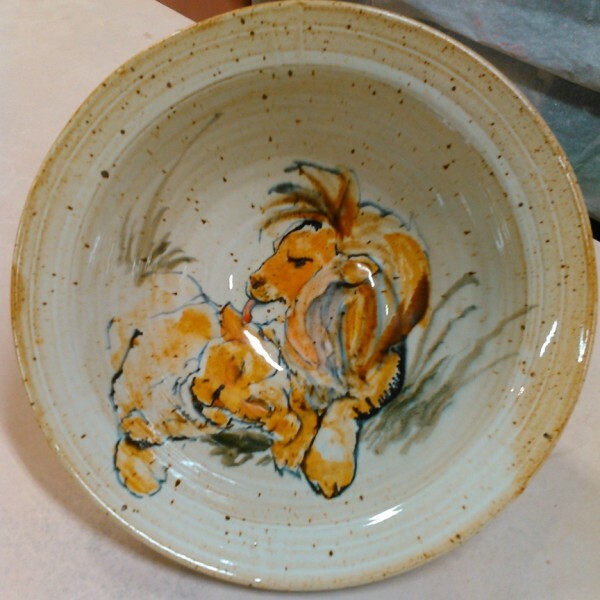 The firing is different, the colorants are different, our drawing styles are very different. But I think the customer will be happy. 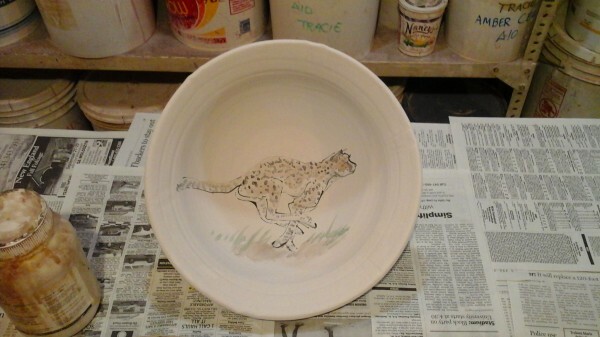 The other kitty I'm working on this firing is a cheetah, a special order painted mug for another potter's son. I warm up on this medium server. That's one fast cat.